The Mayan Rivera and the Yucatan Peninsula are blessed with unique underground limestone caves etched out of fresh water. 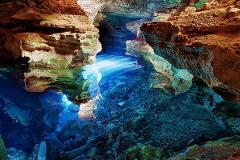 The mineral rich water filtered through the limestone forms spectacular stalagmites and stalactites. Diving conditions in the cenotes of Tulum, Playa del Carmen and the Mayan Riviera are ideal - crystal clear freshwater, moderate temperature and superb visibility are the main features in these exclusive cave systems that make your dive a unique experience. 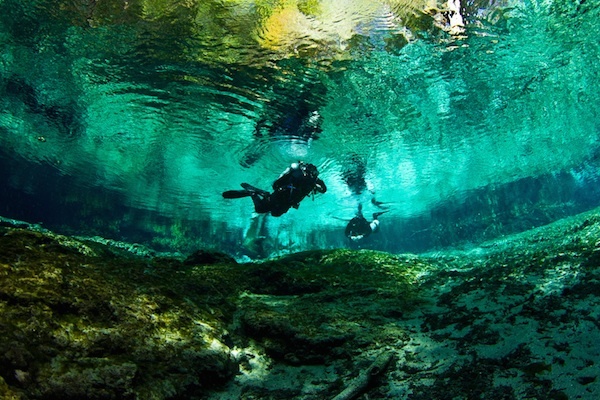 In the area you will find many options and kinds of cenotes for cavern diving - Ponderosa, Carwash, Aktunha, Calavera, Pit, Angelita, Chak Mool, Dos Ojos, Dream Gate, Tajmahal and Grand Cenote are the most famous and common in the area, full of wonderful rock formations, light beams, haloclines and air domes. Most of the cenotes in the region are shallow dives between 8m/25ft and 12m/40ft but there are also some deeper cenotes that are suited for advanced divers only. IMPORTANT: Diving at Caverns, Caves & Cenotes may be challenging for some people, also, be aware that coming in and out of the cenotes requires a bit of strength. we highly recommend you to be fit before doing this activity. Cavern Diving - Dive in the Cenotes of Playa del Carmen & Tulum!